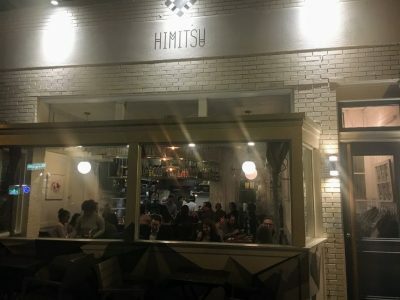 Himitsu means “secret” in Japanese, a bit of irony that seems funnier once you’re comfortably seated in this 24-seat jewel box than when you’re standing outside in twenty-degree weather hoping to snag a table when the doors open at 5 pm. Do yourself a favor and don’t show up with an incomplete party because they won’t seat you. There’s nothing more painful than seeing people behind you in line getting seated while your wife is stuck in a traffic jam on North Capitol even though Waze told her it was clear sailing. Not that that’s ever happened. But once you’re seated and you apologize to your wife for the tenor of your texts sent in a state of near-despair — hypothetically — all the stress melts away. Because right now Himitsu is my favorite restaurant in town. I should say it’s still my favorite because it ranked #1 in my 2017 list of top DC restaurants. 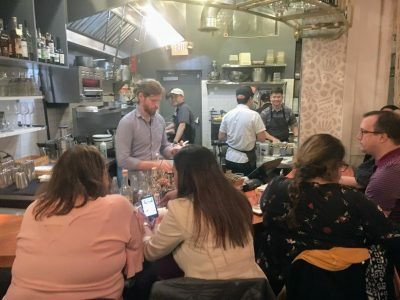 Then Eater named it one of the 12 best new restaurants in the country and I worried it would be trampled on by the masses or expand into something unrecognizable. But my visit this week showed that nothing’s changed. In fact, Himitsu’s better than ever. 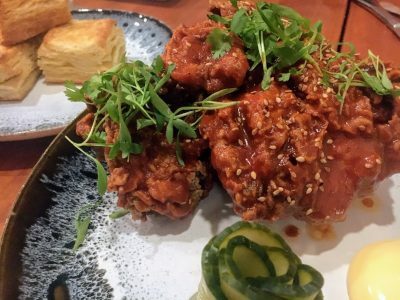 Co-owners Kevin Tien and Carlie Steiner are still there — he’s the executive chef and she runs the beverage program and works the front of the house. Although this is one restaurant where distinguishing between the front and the back of the house is pretty meaningless. It’s really a single room. Sometimes Kevin comes out of the kitchen area to deliver a dish he’s just cooked and you don’t think anything of it. It’s about as personal as cooking gets. What do I love about Chef Tien’s food? It’s idiosyncratic without being forced. It’s got a Japanese emphasis but incorporates influences from across Asia and even Latin America. There’s fresh herbs in almost every dish and a pop of acidity that keeps even the heaviest dishes from becoming dull. Mostly it’s just flat-out delicious. I could eat this food every night and never tire of it. Or at least I’d like to try. The view from the front table to the rear of the kitchen. I said it was cozy. It’s the only restaurant I can recall where the bartender (the guy in the grey shirt) shares the kitchen with the cooks. 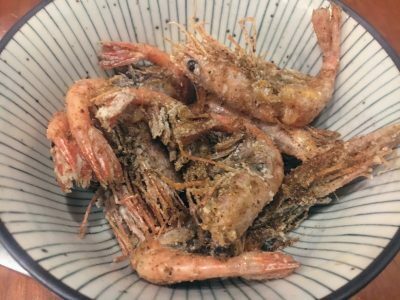 I’m not a huge crudo fan — I tend to prefer actual cooking — but for Himitsu I’ll make an exception. This one provides a nice smolder of heat to go with the sweetness of the orange, the fish sauce funk, the tang of the yuzu and the fresh herbs. 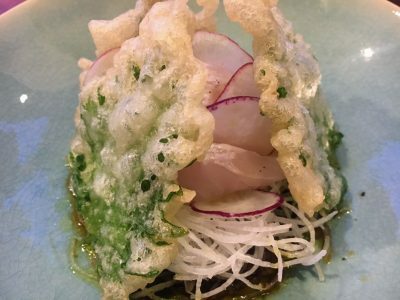 The softness of the fish in this one contrasts nicely with the crunch of the perfectly-fried tempura shiso leaf and radishes. This is actually a very clean dish even though the ingredient list seems long. It’s basically batons of perfectly-browned eggplant in a delicate Asian vinaigrette. Anyone who’s tried to cook eggplant knows the challenges of cooking it through without overcooking or having it soak up too much oil. I’d love to know how they do it but I’m sure the answer is something unhelpful like practice it 10,000 times (h/t Malcolm Gladwell). 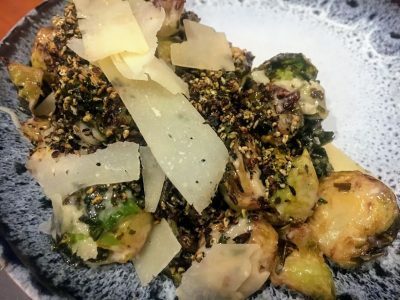 It may be hard for millennials to believe, but there was a time when no one thought about Brussels sprouts. They just weren’t a thing. Restaurants didn’t serve them and grocery stores generally didn’t stock them. Then they were suddenly everywhere, as over-exposed as a Kardashian with a bathroom mirror and equally boring. This preparation could bring you back into the fold with its Japanese-Caesar vibe. 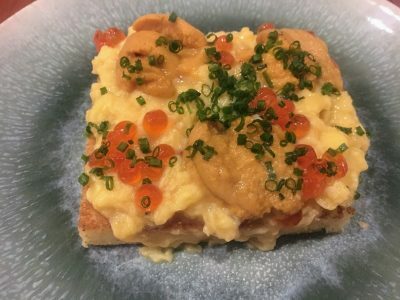 I would’ve been happy with just the soft scrambled eggs, pops of fish roe and buttery brioche. But they do make a great vehicle for the uni. If you like the cartilaginous mouthfeel of soft-shell crabs, these are for you. Pop the whole thing — shell, head and all — into your mouth and get the full effect of the warming and not-too-numbing combination of spices. Love this dish. 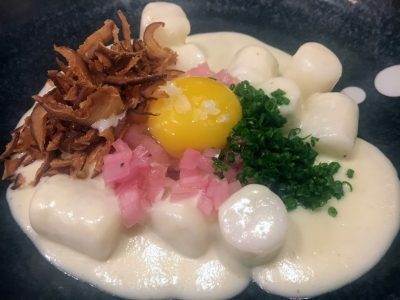 Rice cakes are the faux-gnocchi, bathed in a creamy sauce that tastes like the onion dip of your dreams. 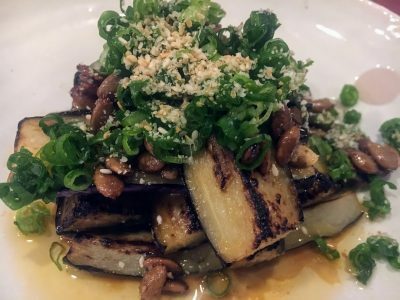 The crispy shiitakes add umami and texture, the pickled onions brightness, and the chives freshness. Mix it all together with the egg yolk and I hope you’ve ordered one for yourself. Another terrific dish with medium-rare and tender duck breast. 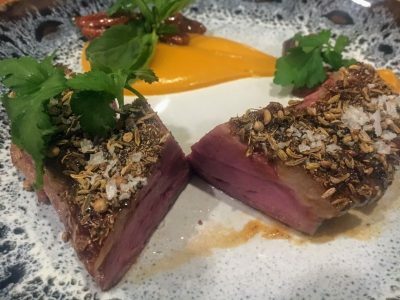 But the star is the coriander-fennel crust which is perfectly balanced and separates the dish from the hundreds of other duck breasts in town. The famous fried chicken. Cut the boneless thighs into pieces and make a biscuit sandwich with the pickles and kewpie mayo. There’s a reason this dish stays on the menu. A couple last things to know. First, there are no desserts currently being offered at Himitsu but they do bring some tasty nut brittle with the check. Second, I suppose I should say something about the extensive wine and cocktail program. It’s definitely extensive. I’m sure it’s good. I had something with lime and ginger and a liqueur from Bolivia. Then I had a glass of red wine from somewhere that wasn’t Bolivia. Sorry, when it comes to alcohol, you’re on your own. This isn’t Rick Drinks DC. So that’s Himitsu. Go now, before something changes for the worse. In a few weeks, I’ll be unveiling my 2018 list of Top 20 Favorite Restaurants. Please act surprised. Looks like an intriguing place! Loved your review. Thanks, Laura! 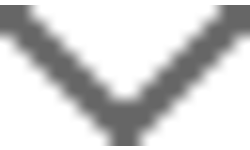 You’d love it. Awesome review! Covers so many dishes which is really helpful for when I get there and have to choose. So Rick flagged Himitsu as a top DC pick and then later Eater named it one of best nationally? I think I need to start jumping on Rick’s top picks faster. Thanks Paul, they may not have the same dishes when you go but whatever they have will be great. Great review Rick. Love the beautiful pictures and descriptions. Can almost taste it! Look forward to a visit. Thanks Robyn! Let me know if you go. 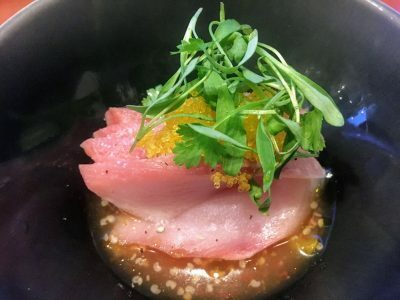 Great review, do you recommend the chef menu (on Mondays) or the regular menu? Definitely the regular menu, especially now that you can reserve at the bar for the regular menu. The Monday dinner is still very good but you’re all eating the same things and it is pricier with the drink pairings built in to the price.